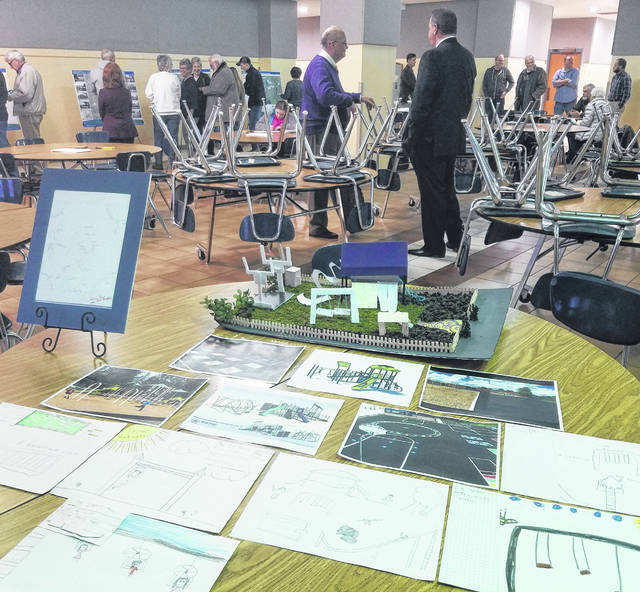 Photos, drawings and a model, all created by students, offered ides for improvements to the Imagination Kingdom playground during a community forum Thursday at McClain High School. Village and school officials, along with Greenfield community members, came together Thursday in the McClain cafetorium to share ideas about a park, a playground, and the school’s search for a superintendent. The public meeting was held more as an open house type gathering, where officials were introduced and the basis of the event discussed before the approximately five dozen citizens in attendance mingled, observed displays, and offered their input and ideas on the community matters of the night. David Whitaker, a landscape architect with Human Nature, a landscape architecture and environmental planning firm out of Cincinnati, invited attendees to view several large display boards depicting aspects of Felson Park.He asked the those in attendance to “think outside the box,” and to mark the playground item examples on two of those boards they liked with stickers, to draw out their ideas with provided paper and markers, and to jot down any ideas and add them to an idea board, all of which Whitaker said would become part of the “design exploration” process for the park. Greenfield City Manager Todd Wilkin said all of this will aid in putting together a plan for Felson Park, then grants will be sought to bring the plan to fruition. For those who couldn’t make it to Thursday’s meeting, he said the information boards displayed at the meeting will be displayed at an upcoming boys basketball game where people can offer more input. The information will also be available on the Village of Greenfield, Ohio Facebook page where people can comment on the information and leave their own ideas. The public is encouraged to continue to offer its input. School board members Sandy Free and Marilyn Mitchell fielded suggestions on the board’s search for a permanent replacement for superintendent Joe Wills, who is set to retire next month. Free and Mitchell said they spoke to many individuals offering input on the matter. Last month, longtime educator and retired Wilmington Superintendent Ron Sexton was hired as a consultant to work alongside Wills prior to his retirement. Upon Wills’ retirement, Sexton will be hired as interim superintendent until the school board hires a permanent replacement. Elementary and middle school staff were on hand with photos, drawings created by students, and a model crafted by art students — all depicting ideas of what the aging Imagination Kingdom playground, but by community volunteers in the early 1990s and in need of an upgrade, can be. Staffers said they received a lot of positive feedback and ideas throughout the evening. Wills said a committee including staff and PTO members has already been formed regarding the wooden playground. The input from the public will help as the committee moves from these early stages on to a plan for the Imagination Kingdom. While the playground has provided more than two decades of enjoyment, repairs and improvements are needed. The public’s input was wanted because, even though the Imagination Kingdom is a school playgound, Will said it is seen as a community playground.